Starting with Apple's Fiscal 2019 -- which began this holiday quarter -- the company will be reporting its hardware sales only in terms of revenue, rather than unit sales. As previous segments in this series have laid out, the cynical take that Apple is doing this in an attempt to hide failure is simply false. Conversely, Apple's historical quarterly unit sales reporting has given analysts and pundits data that they frequently interpret incorrectly. In doing so, they obscure the company's actual performance and distract from its real value and potential. Going forward, Apple's revenue-only reporting will still provide a clear picture of the overall health of each of its business segments -- the same way that Microsoft, Samsung Electronics and other large companies with multiple lines of business report their quarterly performance without necessarily enumerating any units sold. The shift puts a new focus on what is really the most valuable aspect of Apple's global operations. Today, that's commonly understood to be iPhone sales. Just over a decade ago it was thought to be iPods, and prior to that it was assumed to be Macs. The real value of Apple's business has never changed. The real reason why Apple has always been uniquely able to sell premium hardware in a marketplace full of less expensive, generic commodity is its ability to successfully reach people, convince them that things are better inside the Apple ecosystem, and then retain their loyalty by delivering what Apple's chief executive Tim Cook refers to as "user sat." Essentially, Apple doesn't sell people units. It sells units of people on Apple. Apple's massive installed base represents an Elysium of buyers that consistently generate ongoing hardware, software, and services sales for Apple. It's also the premium demographic of consumer electronics buyers, necessitating Google to pay Apple billions for search traffic. Unit sales simply don't reflect the true nature of Apple's business. Outside of Apple's installed base of users, there are a series of PC makers who collectively sell more computers than Apple. However, Windows PC buyers are not necessarily loyal to any specific PC maker, as reflected in the constant shift in sales share between them. As Samsung has demonstrated, achieving years of large unit sales is meaningless if it doesn't generate sustainable income, particularly if those sales can subsequently be stolen away by lower-priced rivals. Samsung Mobile is now dragging the rest of the company down in profitability in part because it achieved unit sales without actually selling those buyers on Samsung. The size of installed base "sold on Apple" is now so large that it acts independently of the industry. While overall sales of PCs, tablets, and phones are shrinking, Apple's Mac, iPad and iPhone have been bucking that trend. It's not simply that Apple is "raising its prices." Rather, it's expanding its offerings to include more luxurious products on the high-end, even as it now offers a $330 iPad and iPhone 7 starting at $450. What's new is that Apple's installed base is now so large that it can support a luxury tier that includes a $13,000 iMac Pro, a loaded iPad Pro at $1,900, and the high-end $1,450 iPhone XS Max. Samsung also offers luxury-priced devices, but it doesn't have an installed base that's large, loyal, and premium enough to actually sell commercially significant numbers of those devices. That results in large numbers of Samsung unit sales of smartphones, but at an Average Selling Price below $250, according to Counterpoint Research. Luxury brands in China have only pushed up their ASPs slightly higher, but are still at or below $275. Meanwhile, iPhone ASPs are nearly $800 across sales of more than 200 million annually-- that's a new development that analysts apparently still haven't yet digested. Samsung and its Android rivals in China are generating unit sales but not developing a reliable installed base of users. And because they can't sell higher-end devices in quantity, they can't bring down the cost of expensive components via economies of scale or generate the revenues and the profits that drive the development of future generations of technology on their own, without Apple's help. Because this is a relatively new development-- and unique in the tech industry-- many analysts have no frame of reference to help them understand how Apple's business works, leaving them stuck in the mindset that Apple is still in its desperate 1990s struggle with cheaper commodity vendors over each unit sold. Apple's critics love to talk about the potential of its demise, and nothing has suggested Apple's apparent, imminent death quite like the prospect of its products being "outsold" the same way Macs were outnumbered by the collective sales of Windows PCs, starting in the 1990s. The Apple Computer of 25 years ago was negatively impacted by the rise of commodity Windows PCs for two reasons. First, Microsoft's large alternative PC platform attracted investment from developers that eroded away the level of interest in Macs and Apple's unique development APIs. This impaired Apple's ability to update or add value to its Mac platform, as many of the improvements it made were simply ignored by developers now focused on Windows, where more customers meant more money and a greater return on developers' investment. Steve Jobs worked to interrupt this vicious catch-22 by focusing Apple on fewer Mac models that could sell in higher quantities. Jobs also targeted areas where Apple could shine over commodity PCs, focusing on multimedia, education, ease of use, and the technical lead PowerPC briefly delivered during Intel's misstep with Pentium 4. At the same time, Apple also worked to adopt Intel chips, USB, and other technologies that allowed it to share some of the economies of scale that were incrementally bringing down the component costs of PCs. The number of Mac units Apple was able to sell each quarter was a closely watched barometer of how well its various initiatives were working to win over PC user "switchers." Apple's dedicated installed base of Mac users have long appreciated the fact they were paying a premium for a superior experience. However, the Mac's price premium still prevented Apple from successfully attracting large numbers of PC users who had grown accustomed to saving money by putting up with the rougher edges of Microsoft's haphazardly managed Windows platform. When iPod arrived, millions of new people were exposed to Apple's "far less frustrating" experience, where layers of complexity were purposely stripped away-- not to demean the user's ability to figure out endless series of technical minutae, but to free them from having to waste time dealing with it. Jobs' iPod taught users to pay a premium for a premium experience. That lesson was more convincing in the individual world of everyday electronics, compared to the dauntingly complicated, technical patriarchy of desktop computing. Seven years later, Apple went from selling 3 million Macs a year to annually selling 50 million iPods and 7 million Macs. But more importantly, Apple wasn't just increasing its unit sales -- it was vastly increasing its installed base of loyal users. In 2008, the active Mac installed base had reached 36 million machines. That was still a small fraction of the PC market, but it represented a premium demographic of users capable of attracting some specialized attention from developers. It was iPhone that really erected a walled garden of constrained experience for users, one that minimized the nature of personal computing so much that nobody thought of the new mobile computer as being a "computer" at all, but rather just an effortlessly simple device that could browse the web, listen to music, take pictures, play games, message friends and run a new class of spectacularly easy-to-use apps. In three years Apple was selling 50 million iPods, 40 million iPhones, and over 13 million Macs per year. While the tech media obsessed itself with unit sales of iPhones -- and initially smirked in contempt of its inability to execute Adobe Flash applets and regularly announced how much they hated that users were unable to compile their own kernel or side-load bootleg apps from random untrustworthy sources -- none of that helped predict what was about to happen. It also didn't stop iPhone from blowing up into a force that completely destroyed every other existing smartphone platform of the day within just its first few years. Giant established mobile phone makers Nokia, Blackberry, and of course Microsoft's Windows Mobile partners such as Samsung and Sony formerly had large unit sales. In fact, Nokia and Blackberry kept selling huge unit numbers of phones even as it became clear that they were completely outgunned and had no functional strategy for competing with iOS. Their unit sales collapsed suddenly and spectacularly, offering no real indication of health until it was too late to matter. Apple's iPhone wasn't simply stealing unit numbers away from Nokia and Blackberry -- it was building upon the installed base of its satisfied Mac and iPod users. Apple's installed base, not merely of machines but of users-- was increasingly growing more important to understanding Apple's potential for success than just the unit sales it sold each quarter. While initially small, the unit sales of iPhones meant that Apple was attracting buyers into its retail stores, where it could sell them Macs and other products. By 2010, Apple's installed base of users was large enough to be sold a new category of device. Apple adapted its iOS architecture to deliver the larger, tablet-sized iPad that year, which undercut the foundation of the conventional PC market and caused the entire Windows platform to tilt sideways as users flocked to Apple's dumb-simple device by the tens of millions every year for a period of time comparable to reign of Windows 95 through Windows XP. The size of Apple's installed base was now capable of launching another new product category: Apple Watch, which inherited the sports-centric, wearable functionality of iPod, and added a fashion-oriented element of exchangeable bands and customizable faces. Its tight integration with Continuity, Health, Home, Siri and App Store titles helped it to grow within Apple's installed base of tech-hungry buyers even as Samsung's larger unit sales of Androids did virtually nothing to launch Galaxy Gear into a functional orbit. Microsoft's once important Windows platform was similarly unable to drive sales of its cheaper Band, and despite its supposedly vast "leading" platform of Android, Google's Wear efforts have flopped as well. Over the last year, Apple sold more than 217 million iPhones, 43 million iPads and 18 million Macs. Those are the last official unit sales numbers we're going to get. 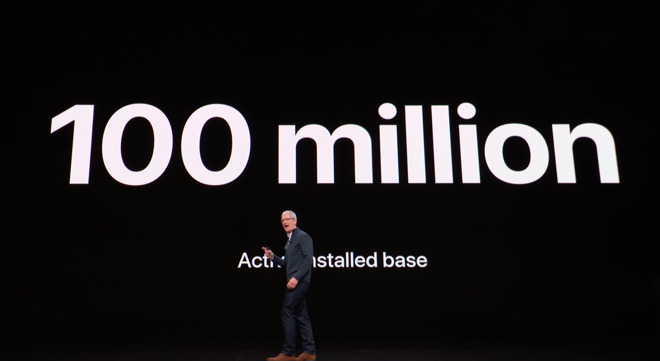 Apple also revealed this year that the Mac installed base had grown to 100 million. Rather than understanding the integrated nature of Apple's businesses and how its product sales feed each other and launch new categories, many analysts and industry pundits have been distracted by focusing unit sales of specific categories. This is reflected in observations along the lines that Apple's non-iPhone businesses-- Mac, iPad, Services and Other-- are all so small compared to iPhone in units that they are a "rounding error" or "barely move the needle." Rather than competing with iPhone for attention, Apple's base of iPhone users is driving business to its other segments-- which are individually about the size of Amazon Web Services or Facebook! Conversely, the hardware segments of companies that don't have an iPhone business, like Google Pixel and Microsoft Surface (about $4.5 billion), are a fraction the size, if they can register at all. It's a huge stretch to say that Google's search is driving Pixel at all, or that Windows, Office 360 or Azure are driving Surface. Firstly: for third party developers, the number of new Macs sold per quarter is far less interesting than Apple's growing, premium installed base of Mac users. The Mac installed base of users is both growing large enough to support new development and is also more likely to pay for software and services-- certainly more so than users in Microsoft's PC platform who largely weren't even willing to pay to upgrade to Windows 10. Google's Chrome OS platform is not only tiny, but almost entirely made up of K12 schools looking for a nearly free solution. If you combine Windows PCs and Chromebooks, various vendors' unit sales look more significant than they really are-- particularly if you compare them against only Apple's Macs and segregate iPads into a separate category, as research firms like IDC do. But Apple's installed base of premium users tells an entirely different story, one that's actually true. Secondly: the Continuity and familiarity between Macs and iOS are actually quite important, but goes missing when you break down Apple's installed base of devices into units of products. Further, the similarities in development and coding tools between Macs and iOS means that companies that have already invested in iOS because of its size and importance can repurpose much of what they already know to bring their software to the Mac. Apple is making this even easier in its recent initiative to enable iOS UIKit apps to run on Macs-- starting this year with its own internal iOS apps including Home, News and Stocks, and expanding next year to allow third parties to bring their iOS apps to the Mac App Store. The tight integration of Apple's huge installed base of users is not reflected in Mac unit sales alone. Thirdly: the WinTel PC economies of scale that once worked against Apple have now virtually vanished. Instead, you can observe even more powerful economies of scale in Apple's internal development, where features created for the more than 1 billion iOS devices can be adapted to work across its 100 million Macs. This includes services like Maps, Siri, and News, which would have been impractical to build just for the Mac. Apple's massive, highly profitable iOS mobile platform allows it to pay for other new technology investments that benefit Macs, including APFS and its custom T2 silicon with Apple's custom SSD controller, encryption, support for Hey Siri, and security for features like Touch Bar and Touch ID. Looking just at unit sales of Macs, Apple's investment in macOS-- creating a substantial new version each year, with a half dozen minor updates in between, along with related software, hardware, and firmware technologies used in Macs-- barely makes any sense. Other PC makers that maintain global unit sales of 20 million computers are largely shipping commodity hardware components packaged with Windows, with very little proprietary feature innovation. They can't afford to invest very much into their PC business. No PC makers have a massive, wildly profitable mobile device business that subsidizes development of new technology. And the declining nature of the conventional PC market means that Microsoft is increasingly less interested in driving investment in Windows development. More importantly, in lacking a large, loyal installed base of users, generic PC makers can't count on anyone buying its new products, but must instead compete against other generic PCs almost entirely on price. That requires making value engineering design compromises that help differentiate Macs as premium machines. Huge potential expansions of volume shipments into new regions are growing scarce. And the growth that is occurring is happening in emerging countries where already slim margins are being pared down even further by cutthroat pricing competition among device makers. While Apple has some near-term hurdles to jump in markets like India, its long-term strategy is maintaining iOS as an aspirational brand, so that once there's an installed base of smartphone users, it can upgrade them to iOS the same way it upgraded Americans from Windows Phone and later Android; Japan and Europe from Symbian; and China from Linux and Android. In part, that's because Apple has a functional business model for increasing the desirability of its products in a crowded field. For the last twenty years, Apple has consistently been selling hardware at a profit that can fund investment in new technology. And rather than that model wearing out as a strategy, it is working increasingly better over time, launching new categories of products and enhancing the lives of Apple's base in a way that retains their loyalty. The base is growing substantially and the price they are willing to pay keeps increasing. Alternatively, commodity hardware producers have been locked in a vicious cycle of lower prices and even cheaper competition that is driving them out of business. Slim margins aren't enabling them to invest in technology, and like Apple in the 1990s they are locked out of the economies of scale that the most valuable mobile platform is driving. The standouts that are seeking to copy Apple's model, including the Microsoft Surface, Google Pixel, and Samsung Galaxy brands, are spending billions on product development that isn't resulting in high volume sales or sustainable profits; instead, they're merely burning up resources generated elsewhere by those companies. As Zune, Windows Phone, Nexus phones, Chromebook Pixel, and Galaxy Player all demonstrated, unsustainable sales volumes will eventually result in failure, despite many assurances that these companies are invested in a long-term approach. That raises the question: what is preventing other companies from copying Apple's success in building a thriving installed base of loyal, premium users? The next segment in this series will examine why. ...this is it. whether it was macs, ipods, iphones, or whatever, Apple is selling more than the SKU. Few corps have been able to achieve this, and none have ever done so as well as Apple. Trolls, haters, pundits, and neckbeards simply can’t understand that. Thankfully, they don’t have to. Apple needs to buy back shares (increased rate) or raise its dividend. They’re going to have a difficult time selling their new philosophy to stock analysts. Going Private would be ideal, but Apple Stock creates considerable buzz that helps with mind-share. "churning out ever-increasing volumes of hardware units" isn't exactly what Apple have been doing for the Mac lately. In many ways they have gone to lengths to sabotage their own ecosystem and user base for macOS over multiple years. Seen in that light, the narrative on focusing on users rather than units is not particularly trustworthy. I believe the investors understand that. Cause and Effect! I don't feel like you read the editorial. Brilliant analysis! Really enjoyed it. If Apple doesn't make it, I don't buy it. I don't buy third party speakers, keyboards, mice, monitors, etc., etc. I try to avoid buying software that is not made by Apple. I use Apple Mail, Podcasts, Calendar, News, Pages, Numbers, Photos, Notes, Keychain, Safari. I buy/rent all my media through iTunes. My watch is an AppleWatch. My headphones are Apple AirPods. My set top box is an AppleTV. My phone is an iPhone, notebook is a 2017 MacBook and I own an iMac, and an iPad mini. I use Apple CarPlay in my car. I've put off buying a DSLR b/c I don't want to deal with a clunky OS. I don't even look at other manufacture's products, not Samsung, Google, MS, Dell! I consider them all subpar when compared to Apple's offerings. But is Apple really focussing on users? There's an interesting piece on Fraser Spiers Blog on how a vocal advocate of iPads is moving to a ChromeBook as his default mobile computing device. The combination of power and portability across several use cases was ultimately too much to ignore. To gain the same degree of functionality using Apple kit would require a MacBook and an iPad and whilst Apple may think people will buy one of each, many users faced with the Google ecosystem will not. The point is that Apple is still focussed on selling devices (iPad + MacBook) whereas the user faced with an all embracing solution is going to go with the cheaper option. That may not be true for schools although ChromeBooks apparently are killing the iPad in US schools and it's only a matter of time before the same thing happens in the UK where price is everything. Whether Apple will bring out something similar to the old e-Mate, with an A12 processor running IOS remains to be seen, but if they don't they really should. It would give the ChromeBook a run for its money. I did and it is partly based on inaccuracy, lost history and wishful thinking. Sentences like "At the same time, Apple also worked to adopt Intel chips, USB, and other technologies that ..." is cringeworthy. USB was introduced with the original iMac on System 8.1 in 1998 on a PowerPC based machine, almost 8 years before Intel processors . USB was out 2 year PRIOR to Apple's adoption in 1998. It was languishing on the vine in the PC market. His statement was accurate, the syntax may not have been clear to you. Yes they are. Read the chart again. Those aren't unit sales, they're PROFIT share. Globally Apple crushes the competition in profits. We're aware, and I believe you're misinterpreting the paragraph in question. This isn't a history of Apple hardware roll-outs piece, nor should it be interpreted as such. Apple's march to Intel hardware began with the purchase of NeXT, and with it, the X86 NeXTSTEP, just not executed on the Mac until much later. The USB effort, Intel, and "other technologies" were being worked on contemporaneously on Jobs' return. Look, I get that it isn't "your" Apple anymore. You and I have gone around on this a few times. That doesn't make Dan's assessment any less valid, and your focus on the Mac as Apple's be-all-end-all product isn't realistic and hasn't been for half a decade. Looking at "in that light" is trying to see an entire room's contents, based on a four-inch beam of light into the room. Conservatively, for every Mac user there are 18 iPhone and iPad users, whether we like it or not. Agree. Apple locked itself up in the upper/premium segment, which for a cash (and single product) dependent corporation like theirs, ultimately is considered as bad strategy. Their new service orientation doesn’t compensate for that (yet). Now going down the price ladder with the XR isn’t going to satisfy financial analysts or markets until they can prove they keep their margins healthy. Instead of that, their refusal to publish sales figues isn’t a very strong sign that generally in the financial world doesn’t make for a better outlook. The overall notion is that they know things better than the financial world. Hence the stock trend. This made me sad. I feel pity for you. My nieces and nephews are in high school (4 kids) they HATE the school Chromebooks and demand Microsoft Office (installed version) on their machines. Chromebooks are a solution for schools to get their students the bare minimum, with a minuscule budget, but it’s not what the students want. I’ve tried to get them on IPads with limited success. I think I’d have better luck with the new 11” and 12.9” but getting away from Office is a problem. The iWork word processor (etc.) isn’t intuitive compared to Microsoft’s. The ideal situation is an A series processor running full office, but IOS isn’t cutting it on iPads anymore. Why not use Office for iOS? Beat me to it. If MS Office is really what they want just use the iOS version. I still think an updated version of the eMate could find a niche. The problem is that Apple has become so greedy for profit such a device would only succeed at a low(ish) cost and would quite likely damage sales of both the Air and possibly the bottom end MacBook Pros. I think it’s that Apple recognize that this is a finite planet and you can not grow forever. I do agree that they are in the business of extracting money out of its users, they are a company after all. However, I disagree with your perspective on it. In order to innovate and create new and better technologies you need to invest money. The majority of people on this planet do not have the funds to participate in this type of endeavor, so a company focusing on these individuals will add nothing more to the company outside of their occasional purchase of a phone that has barely any profit margins. You need to sell to people who have money and can afford to contribute to keep you, the company, pushing the boundaries of technology. Now you can extract ‘money’ out of those that have none, but that requires them becoming the product and being subjected to advertising and surveillance. I believe the reason why Apple has upped the cost of entry to their best devices is because more and more people can no longer afford to fund the research to keep a company pushing the boundaries. But this is where the Xr comes into play... Apple is now in a position to deliver an incredibly future forward device to more people off of the backs of those who want or can afford the best. The Xr will be the phone that people can truly start holding onto for 5+ years and have it still working incredibly well. Now how on earth do you extract money out of those people who can buy the second best phone on the market at a price point that is 400 - 700 dollars less than the premium? Through services. Apple is making their cutting edge technology available to more people than ever before, for a price point that allows them to keep pushing forward. Sure it isn’t their flagship phone, but it doesn’t have to be. I really think Apple knocked it out of the park with the Xr, especially when people are becoming less and less interested in having to own the best. Rather they are looking for something they can buy and not have to worry about for a long time. This is something that Andriod is not going to be able to copy for a very long time. I am curious as to how much of it has to do with possibility that they just do not want to change because its time consuming and they have better things to do with their time like... like well anything else. Being a highschool teacher, I constantly hear students complaining when any of their software updates be it iOS, Snapchat, instagram, or whatever it is. Most people really don’t like change. So I tend to think that it’s them not wanting to spend the time changing their habits rather than the device not meeting their needs.